Foot is also the name of a unit of measurement. See foot (unit of length). A foot (one foot, two or more feet) is a body part on the end of a leg. It is used when walking. It is also important for balance: it helps people stand straight. People also use it to kick, in both fighting and sports, football being an example. People's hands and feet have the same shape: they both have five digits (the fingers and toes). Many other animals with backbones also have five digits. The part of the foot which joins it to the leg is called the heel. The bottom of the foot is called the sole. Half the bones in our body are in the foot. Doctors who work with people's feet are podiatrists or chiropodists. Many animals have feet, and there are many different sorts of foot. The feet of monkeys are much like the hands. The hard foot of an ungulate is a hoof. When an animal has soft feet, or feet with soft parts on the underside, we often call it a paw. Many people like to use footwear, especially outside. It has special names, for example sandals, shoes, and boots. When people always wear footwear, especially in hot places or when they are very active, their feet can smell badly (foot odour). Wearing footwear that is too big or small can be bad for the feet. People who have foot, leg, and back problems can also get help from special shoes. People have different traditions in different parts of the world for when to wear footwear. For example, in much of Europe and Canada, people usually do not wear their shoes or boots in a home or visiting. In the United States people often wear shoes inside a home. In Japan, people do not wear shoes in homes, and floors are often made of very soft materials, too soft for shoes. In cultures where people always wear shoes, people sometimes think it is bad not to wear them. Not wearing shoes can be good for the feet, especially for children's feet. Conditions like Athlete's foot affect the feet, causing the feet to feel dry and cracked. In a human foot, there are 26 bones. 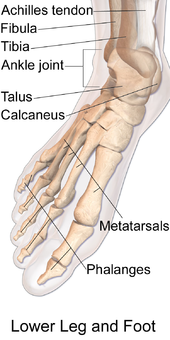 They are made up of 14 phalanges (toes), 5 metatarsals (sole bones) and 7 tarsals (ankle bones). Wikimedia Commons has media related to Feet. This page was last changed on 28 November 2018, at 20:56.